Here is the full track list (soundtrack) to upcoming video game Crackdown 2. It is a third-person shooter video game for Xbox 360, developed by Ruffian Games and published by Microsoft Game Studios. The game is due for release on July 6, 2010. 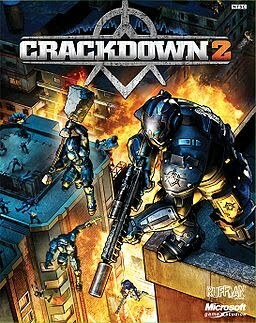 Crackdown 2 features an extensive soundtrack with hits from icons of rebellion? As you've been playing through your review copy of "Crackdown 2," you've probably heard some fantastic (or crazy) tracks as you mowed down Freaks, took on the Cell and set justice in motion your way. These licensed tracks and updated remixes will have you smashing through Pacific City with a vengeance. Public Enemy, Bob Dylan, Johnny Cash, R.E.M. and Whodini? – just to name a few. On top of that, some of these tracks are being remixed by cutting edge artists sharing their interpretations of what the can-do attitude of "Crackdown 2" is all about. Remix artists include Dan the Automator and Domino, The Bug, Sientific American, Mistabishi, Kleptones, King Cannibal, and Tigerstyle. Where can i get these songs?